Also known as melaleuca, Tree Tree Oil has been around for around 100 years. Keep reading to learn more about 5 uses for Tea Tree Oil. I’ve also included some DIY ideas for tea tree shampoo as well as a body scrub! This is probably one of the most popular ways to use Tea Tree Oil – curing acne and skin care routines. Thursday Plantation offers varies products such as a Medicated Gel that is an invisible treatment. I’ve been using this product when I start to see a breakout and it’s been helping a lot. They also offer a Tea Tree Wash Wash Foam and Toner. I know you’ve heard of using coconut oil for your hair but did you know that Tea Tree Oil is also beneficial for your hair and scalp? The Tea tree oil helps to eliminate dry flaking skin and can even be used if you have live. Check out the receive below to create your own DIY Tea Tree Oil Shampoo. This shampoo can help to eliminate dandruff as well as help to strengthen your hair. Make sure to shake the shampoo before every use. It can be stored int he fridge for up to a week. Who knew that tea tree oil had antimicrobial properties that can help to kill off the bad bacteria in your house? Create your own Tea Tree Oil Cleaner by mixing together tea tree oil, water, vinegar and lemon essential oils. It’s perfect to wash counter tops, showers, toilets and more! 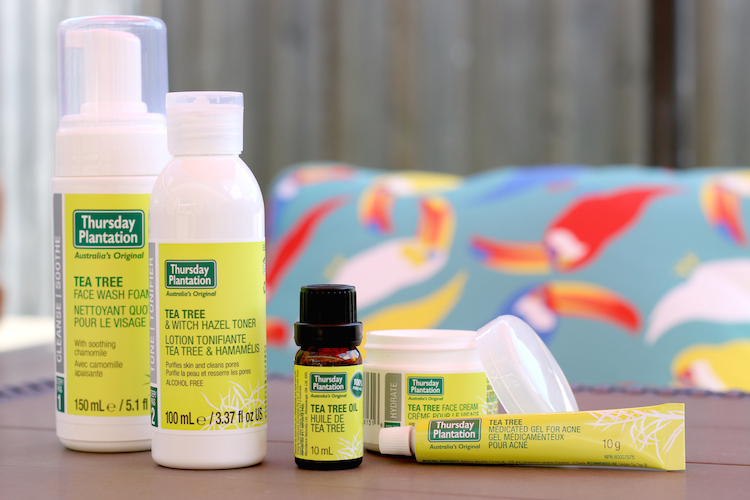 Tea tree oil can help to relieve minor cuts, abrasions, bites and stings. First, wash your cut with water and hydrogen peroxide and then before applying a bandage place a few drops of Thursday Plantation Tea Tree Oil onto the cut. Not only can tea tree oil help with cuts but also with any inflammation on the skin such as Eczema. Use the recipe below to create your own body soap that can help to relieve any itchiness or inflammation. This recipe can be used as a lotion of body soap. Make sure to store it in a tightly sealed container. I was sent products from Thursday Plantation to review. All opinions are my own. Thursday Plantation can be found at Walmart, Loblaws, Superstore, Rexall, Well.ca and Natural Health Food Stores.